Incidents of sharks biting people in Hawaiian waters are very rare, occurring on average at a rate of about 3 or 4 per year. From 1828 to July 2016 there have been only 150 confirmed unprovoked shark attacks including 10 fatalities, three of which have occurred in the last 4 years - a period of an unusually high number of attacks peaking at 14 in 2013. 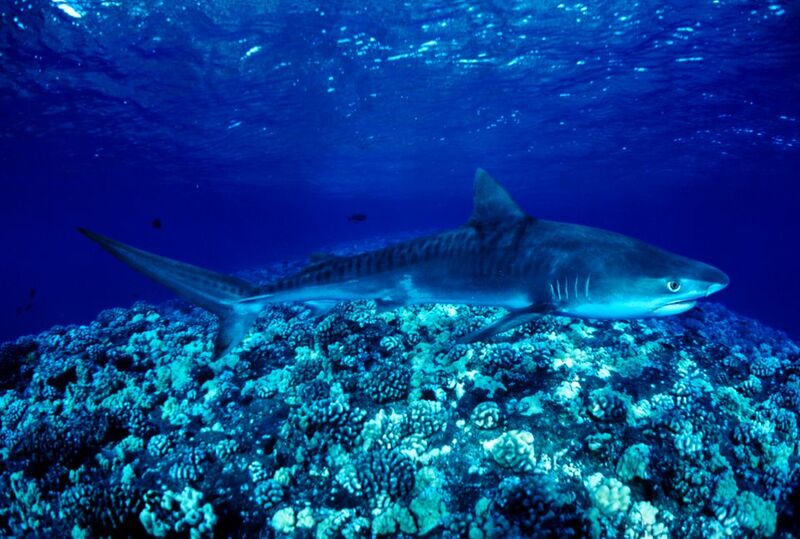 Fatal shark bites are still extremely rare, especially considering the number of people that swim, surf, snorkel or dive in Hawaii's waters. In 2015, almost 8-million visitors came to the Hawaiian Islands and most of them ventures into the water at some point during their stay. People who enter the water need to recognize that there are hidden dangers. Entering the ocean should be considered a "wilderness experience." By learning more about sharks, using common sense, and observing the following safety tips, the risk may be greatly reduced. • Swim, surf, or dive with other people, and don't move too far away from assistance. If you decide to go on a snorkel boating tour, you can be very sure that the boat will have spotters in the water to warn all participants of any approaching danger. Shark attacks during these types of tours are extremely rare, virtually unheard of. • Stay out of the water at dawn, dusk, and night, when some species of sharks may move inshore to feed. Most attacks occur when sharks perceive the swimmer to be one of the natural food sources, such as a monk seal. • Do not enter the water if you have open wounds or are bleeding in any way. Sharks can detect blood and body fluids in extremely small concentrations. • Avoid murky waters, harbor entrances, and areas near stream mouths (especially after heavy rains), channels, or steep drop-offs. These types of waters are known to be frequented by sharks. • Do not wear high-contrast clothing or shiny jewelry. Sharks see contrast very well. • Refrain from excessive splashing; keep pets, which swim erratically, out of the water. Sharks are known to be attracted to such activity. • Do not enter the water if sharks are known to be present, and leave the water quickly and calmly if one is sighted. Do not provoke or harass a shark, even a small one. • If fish or turtles start to behave erratically, leave the water. Be alert to the presence of dolphins, as they are prey for some large sharks. • Remove speared fish from the water or tow them a safe distance behind you. Do not swim near people fishing or spearfishing. Stay away from dead animals in the water. • Swim or surf at beaches patrolled by lifeguards, and follow their advice.